I was suffering from a sore back and could hardly walk. But early in the morning of July 7, 2011 I awoke and my mind was in a poetic mode on why I exist. Later in the day I wrote "Who Am I?" I hope you like it. How is it that I know I exist? What makes the draft that vents my bliss? 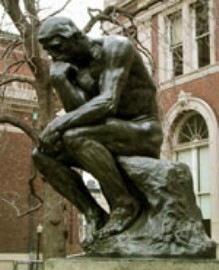 I am like “The Thinker” who sits. Since "I think" with Descartes I concur; “therefore I am.” But since even computers calculate; do they also think? While Intel, Microsoft & others march towards the human rhyme; I don't have much time. I feel the pull to go deeper into the scheme. What is my consciousness? Is my brain aware of itself? How could a few pounds of gray matter conjure up marvels all around? There’s electricity flowing inside my head as synapses fire and neurons wink. But even Dr. Frankenstein gave his monster a jolt. If it's all just sparks and flesh why am I different than the rest? There are robots and science fiction androids but each of a kind is exactly the same. That's not you & me; we didn't come off a line. There’s more to this than meets the eye. Why are my light receptors so shy? The detectors we build reveal hidden realms. We aim our telescopes onto the sky and launch spacecraft with devices to search the abyss. Our microscopes & accelerators pierce into the tiny domain. Atoms are in the minority while dark matter & energy are everywhere. "Maybe the secret of mind lays within the shady things we've yet to see?" Sure religious books tell stories and scriptures are mirrors; but they only reflect those in school. “We’ll tell you who you are; but you'll have to stay!” They taught but I wouldn’t play; I saw their gods were handmade. Psychologists are okay but they talk & mainly say, "Your time is up, see you next week." Philosophers are wise but speak of what can't be. "You're wrong; your definition sprung a leak." ATI* you are everywhere. I see and intuit you and don't have to believe. Knowing you makes me feel serene. Yet I have a question in mind. “Could it be when I die, I’ll still be?” Maybe there’s a swarm of dark particles that hover around me, an aura that is the real me. ATI you are everything and therefore things can't perish. Changes are constant & whatever has passed, merely faded. All things in some way ... must survive! ATI, you've given me peace & taken away my fears. Now I know you will remember me! * ATI means "All that is"